As a coin collector for more than 50 years, I have a very select library. 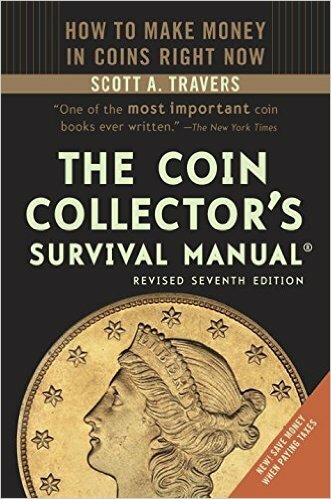 For years, Scott Travers’ The Coin Collector’s Survival Manual was a must-have work that informed and enhanced my numismatic education. Viewers of Coin Update know about my background in coins, including serving as a columnist for Coin World and as a former member of the Citizens Coinage Advisory Committee. Many also know that I am a journalism educator and author of media ethics and technology books, including works by Oxford University Press. In fact, I am in the process of writing the second edition of an award-winning technology book, Interpersonal Divide: The Search for Community in a Technological Age. New editions require substantially updated information. After this review appeared, we were informed that this is not a new edition but an update to the 7th edition published in 2010. It carries a 2015 copyright. It was published by Penguin Random House in September 2015. So we are clarifying that here. A revised edition is an opportunity to sell the work to a wider audience. So several of our observations still stand. Moreover, we hope that the author understood those observations for the 8th edition, when it appears. What does this mean now that we have clarified the publishing situation? For starters, this is still one of the few must-have books. If you have the 7th edition, originally published in 2010, then you probably don’t need this one. If you do not own the 7th edition, you should buy it. The Grading of U.S. Coins, including sections on certification services, manufacturing methods, numerical standards, overgrading and undergrading, and doctored-coin detection. Grading Services and the Plastic Revolution, including sections on the impact of such services, grading by consensus and changes in grading standards. Don’t Let Uncle Sam Pick Your Pocket, including sections on US Mint products, tax obligations, estate-planning secrets and retirement planning. Because this was once a numismatic masterpiece, every level of collector and investor can find something to like and inform in each of the 23 chapters with appendices. However, the savvy reader of Coin Update News, especially a hobbyist with numismatic experience, also may find something outdated or no longer relevant in some of these revised chapters. For instance, on page 148 in the section on crossovers at NGC and PCGS, Travers leaves the reader with the impression that NGC will consider grading coins from other holdering companies when, in fact, that policy was changed years ago. NGC only considers for crossover PCGS-holdered coins, as Coin Update has reported repeatedly in the past. A typical outdated remark in this section notes that resubmitting coins for crossover or regrade consideration entails little risk apart from the grading fee–“typically $100 when done on a walk-through basis at a coin show.” Really? Assuming membership in NGC or PCGS, which allows for submission rights, you can send in three or four coins for crossover for about that same price. We hope the 8th edition of the survival manual will instruct readers on using the Internet for submission purposes, which serves as a permanent record for tax and other purposes. This has the same ISBN number as the 2010 edition. In that light, the work assumes coin purchases will be made through dealers or at coin shows. There is an outdated 13-page section about buying coins on the Internet, focusing on eBay rather than on the dozens of reputable venues and portals offering coins via Internet and smartphones, from Proxibid to GreatCollections. This chapter of Travers’ book includes a section titled “An Exchange of Correspondence with eBay” that is slanted journalism with leading questions by the author, reprinting of contentious replies and few facts that help any collector “survive” the online coin purchasing business. Whose Terms Prevail in Online Coin Auctions? We hope that his 8th edition contains such information. I recommend it for numismatic history, grading practices and services, counterfeit detection, fourth-party grading companies such as Certified Acceptance Corporation, and tax and legal advice. However, if this is the only resource upon which novices depend, they won’t survive if purchasing or bidding on coins online rather than from dealers or at shows. Internet coin buying and selling deserves its own survival manual. That information isn’t in the revised edition. Thanks Joe! I think there may be an update on cameras and comments throughout on several other topics. Not much that stands out. In the online age we’re in, a book like this needs a stand alone website with continous updates. Happy holidays! I received a complementary copy of the book from CAC, coincidentally the book has a green bean on the front. It is my first exposure to the book, I have briefly glanced through it. I will dive in to it a little more. Thanks. P.S. Any crossover results to report? In my opinion, your articles (or experiments) on crossovers are the most enjoyable numismatic material to read. Perhaps it is because it is something that is very relatable to my interests. I do wish there were more articles on grading and submissions in general as well. Thanks, Ryan. I got my copy from CCAC as well. I’ll do more crossovers in the next column. These are so difficult to find online. I do it mainly to test my numismatic skills. I have had absolutely NO LUCK with ICG coins and am close to not sending in any to PCGS. I have sent in lovely PCI toned coins and am excited to get those back. Happy Holidays, Ryan! Michael, I have been very disappointed in PCGS. There lack of transparency on charges and the absolute unavailability of customer service really left a bad taste in my mouth. I can call NGC almost any time and get someone on the phone. They are kind and easy to talk to while answering questions. It is definatley a interesting subject matter and you are one of the only people who share results, I am sure many readers appreciate that. In reviewing previous articles, I reread the article on NGC’s label buyback program. It is another subject that I find interesting. Do you feel as if a accurate census favors a TPG or are they really interested in the integrity of a accurate census? At paying or crediting 50 cents a label, less than the cost of postage to mail a label back, are they really that interested? I would think that the weighing of the impact of that particular label would more or less be in the interest of the TPG to have accurate data. For example, if a TPG paid 1% of the value of the coin in that label, I would think it would certainly motivate the holders of the crossover and crack out labels that are out there. Perhaps I am overthinking things or thinking with a different perspective. Nevertheless, thanks again for the article and I look forward to your next piece on crossovers. P.S. I have only had luck with one ICG coin on a crack out and resubmit. It was a 1900 MS63 ICG in which the holder had become hazy and was very unattractive. It came back from PCGS a MS63 after I cracked it out. I only have results from one, because the time devoted to get that dollar out of a ICG holder was far more complicated than I ever imagined. In addition to the crossover column, I’ll also do one next year on returning labels to TPGs. I know about PCGS charges. It just raised mailing rates, I think. Small increases. Both PCGS and NGC are aware they are near the top of what they can continue charging without more business going to ANACS and ICG. I don’t have the same experience as you with PCGS, though. I have never, not once, been unable to speak to customer service, which always has been helpful. True, I am on hold for minutes at a time, and I think PCGS needs to invest more in Customer Service to reduce wait times (and more graders to reduce wait times there, too). My experience with NGC is ithas superior customer service. But I have issues with NGC. PCGS may grouse when I do articles about it recommending changes. Put “PCGS” into Coin Update News search and you’ll see what I mean. But it has always changed its practices whenever I did such an article. NGC is more than stubborn. It will not change a thing no matter how many times you point out that it is silly, for instance, no unprofessional, actually, not to accept crossover submissions from any service except PCGS. 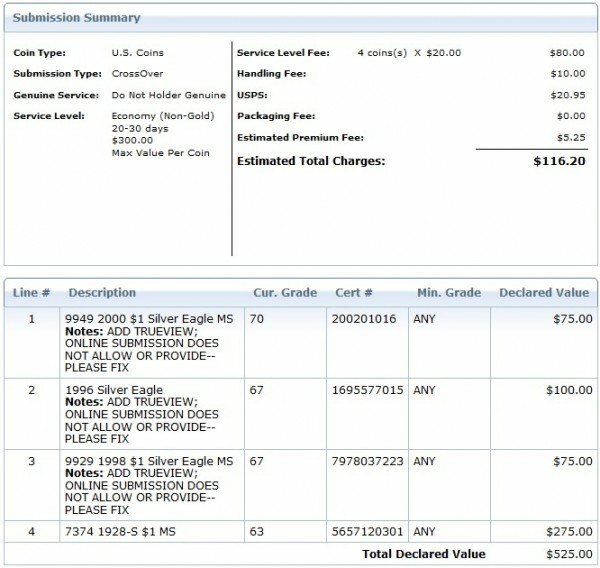 NGC accepts PCGS in its set registries; PCGS does not accept NGC. NGC insists on using Proof Details rather than Unc. Details on its labels. I am frustrated that NGC won’t even respond to my emails on small things when noting that to check a series of certs, you need to open up new tabs on your browser, but NGC believes you are trying to download its photos and doesn’t permit it. I just sent PCGS a note that its online submission form for crossovers lacks a box for TrueView, and I got a thank-you from Don Willis. This just never happens with NGC, which will take pains, if it responds, to argue its case even when its case is dead wrong (proof is a method of manufacture, not a grade). So I just can’t agree with you on NGC vs. PCGS. I rare send anymore to NGC because of its lack of executive customer service. Granted, the employees in its customer service answering calls are tops. Thanks for writing and happy holidays. One more thing: I do like working with NGC;’s S. Schechter. He’s tremendous and knowledgeable.